Carl Evans was born February 23, 1886 either at Rushville, Indiana or in Howard County, Indiana. He listed both places at one time or another. He moved to Wichita, Kansas in 1905 to take job with John James Jones (1871-1944) restoring used cars and then selling them for the Jones Auto Exchange. That was a Ford agency and a forerunner of the Jones Motor Car Company. It was common for successful automobile salesmen to also double as race car drivers in local, unsanctioned auto races in the early 1900s. The old adage, “Win on Sunday; sell on Monday” was never more applicable. Evans found himself successful in both fields and billed himself as a professional race car driver available for hire. Several Kansas auto agencies took him up on his claim and they were not disappointed. Evans married Ethel Luellen Quincy on June 6, 1910. They had one daughter, Dorothy C. Evans (1911-2003). Evans gave his middle name as “Edgar” on the marriage license application and as “Edward” on his World War II draft registration. Several Kansas newspapers ran articles on August 24, 1911 stating that Carl Evans of Wichita was the first “Kansas boy” to fly an airplane successfully when he did so on four different occasions in one day, the last of which covered several miles. Whether, or not, he was actually the first has yet to be independently verified. Evans spent the last part of 1912 playing Auto Polo for touring race promoter Ralph Ambrose “Pappy” Hankinson (1879-1942) of Kansas City, Missouri, who publicly gave Evans and Roltz King (1884-1944) credit for having invented that sport in Wichita. Evans had worked his way up to assistant manager of the Jones Auto Exchange by April of 1914 but was then hired away to be the plant manager of the Wahl Motor Car Company in Detroit, Michigan. The Wahl company soon failed so Evans returned to Wichita late in 1914 and began selling cars for the Arnold Automobile Company. While at the Arnold Automobile Company, he sold the first Dodge Automobile ever delivered in Wichita. In 1915, Evans excepted a position as plant manager, race car builder and driver for the new Jones Motor Car Company. As a race driver, he won the first "Free-for-All" automobile race ever run in Wichita. At one time, he held the 1-lap, 2-lap and 3-lap track records at the ½ mile dirt oval Wichita Fairgrounds Racetrack located across the Arkansas River, west of downtown Wichita. That ½ mile dirt oval racetrack was dismantled in the early 1920s but Evan’s 3-lap track records was never broken. Only one 2-car, 4-lap auto race was run with the remainder of the races on this day being horse, motorcycle and monkey (yes, monkey) races. There were only two entries for the one race scheduled. That four-lap contest was canceled when the Auburn, driven by Harry M. Hicks (1882-1922) of Wichita, stopped on the course after completing just one lap. 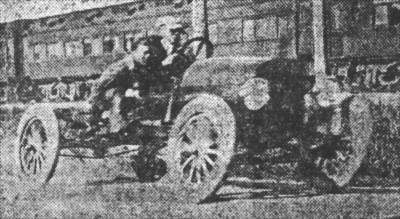 The Ford, driven by Carl E. Evans of Wichita, was already well ahead when Evans stopped beside Hicks’ Auburn with one lap still remaining in the race. Hicks claimed that his battery was dead so he could not continue. Race organizer, Charles Mosbacher, then disqualified both cars as neither had not yet completed the prescribed distance. Time for the 3 laps that Evans ran: 2:25.0 which was a new track record. Feature race winner: No winner was declared. Evans set the 1-lap and 3-lap track records on July 3, 1908, plus the 2-lap track record on July 4, 1908, all in a Jones-Auto-Exchange-owned Ford. The 1-lap and the 2-lap records each stood for 8 years while his 3-lap record was never broken. This track record was never broken. 1st in the only 2-car auto race scheduled. Harry M. Hicks finished 2nd in an Auburn, at least 3/8 of a mile behind Evans. Evans’ winning time was 3:15.0. Feature race winner: Cark Evans of Wichita, Kansas in a Ford. Finish: Evans made practice runs each evening for several evenings during the Sedgwick County Fair but no other driver ever entered so these races were canceled. Race Between Auto and Santa Fe Train North of City Last Night Came Near Resulting Seriously. Big Car Took Ditch at Sixty Miles Per Hour. Pre-Arranged Race Was Not Finished. A race that was never finished was contested just north of the city about 6 o’clock last night between the #405 Santa Fee Passenger train and Carl E. Evans, driving his 45-h.p. Interstate racing car, which is the property of the Arnold Automobile Company. The reason the race was not finished by the racing car was on account of an obstruction in the road from which the two riders in the racer miraculously escaped instant death by only the smallest fraction of an inch. It was to decide a $200 wager that the race was to be run. It had been prearranged that #405, one of the fastest passenger trains on the service, would commence to pick up speed when out of Valley Center (Kansas) so as to be making its best time over the distance of the 2-mile race course. Five minutes before the train was due at the starting point, about three miles north of Wichita, driver Evans and the (Wichita) Eagle representative who accompanied him, were seated in the car and prepared for the start. The race course had been cleared by men in automobiles and one car was stationed just north of the packing plants to warn homegoing farmers. Along the course, automobiles were lined and farmers had tied their teams to one side of the road and were waiting to see the excitement. When the speeding locomotive cleared the last mile gap from the starting point, the men in the racer braced themselves for what was to come and the driver started the powerful engine to throbbing. When the train was within 100-yards of the starting point, the racer started with a bound and the race was on. For the first ¼ mile, the train led as the auto had not yet picked up its high speed. Then, for ½ mile or more, the auto was in the lead and gaining steadily, speeding at the rate of 62-m.p.h., according to the speedometer. It was after the first half of the race that the near-tragedy took place. A house had been tied to a telephone pole while the owner, at a point of vantage, was watching the contest. When the racer was very little distant, the animal became frightened by the fast exhausting automobile engine and broke its halter strap and began to run down the road toward the car! The runaway was taking up all of one side of the road and automobiles were along the other side. There was only the ditch between the rail fence and the horse and buggy, for the car that was then making a 60-m.p.h. rate. There was no time to stop and (Evans) did the only thing that he could do and took the ditch where death seemed almost certain. Not a second too soon, for the horse, with a shriek of terror, a sound that to a human ear is never forgotten, gave a mighty leap toward the lined-up vehicles and cleared the road just as the racing auto passed in a flash! Considering that the car was hindered by finishing by circumstances over which there could be no control, the bet was called off. The driver of the 45 h.p. Interstate racing car in this old photograph was Carl Evans who raced the #405 Santa Fe Passenger train south on Old Lawrence Road a few miles north of Wichita, Kansas on the evening of April 6, 1910. The passenger was an unidentified reporter for the Wichita Eagle newspaper. Photograph is from the Carl E. Evans collection and was published in the Feature Section of the Wichita Eagle newspaper on Sunday, March 19, 1933. Finish: 1st in the 5-car, 13-lap Australian Pursuit race over F. Marvin Light of Wichita, Kansas who finished in 2nd place driving a Crawford. Evans won in 9:21.0 to collect $100 from the purse for the victory. 2nd in a 2-car, 10-lap match race behind Charles William “Will” Swain in a Cole 30 Flyer. 1st in the 8-car, 10-lap Free-for-All race over F. Marvin Light of Wichita, Kansas who finished in 2nd place driving a Crawford. Evans’ time for the race was 6:38.0. 1st in the 4-lap feature race over Vivian Alexander in his own Overland. Evans’ time for the race was 2:40.0. Evans made an exhibition 2-lap run against the clock and turned in a time of 1:16.9. Finish: 2nd in a 2-car, 10-lap match race behind Glenn Breed of Bushton, Kansas who was driving a Buick Model 16 owned by the Bushton Auto Company of Bushton, Kansas. Finish: Although entered, Evans’ name does not appear in the published results of these races and he likely did not compete in them. Feature race winner: Max Wilson of Wichita, Kansas who was driving his own Ford. Finish: 2nd in 3-car, 5-mile feature race behind William Wright “Billie” Headrick of Wichita, Kansas in a Model 10 Buick race car owned by George T. Walker of Wichita, Kansas. The car was known as “Hellen Blazes.” Evans finished a close 2nd place despite having engine trouble. Finish: Evans raced against a Santa Fe “fast train” named the “Missionary.” Evans got an even start and then accelerated up to 70 m.p.h. as the train tried but failed to gain enough speed to catchup to him. On October 1, 1915, Evans and Charles H. Reser formed the Evans & Reser Motor Car Company in Wichita to sell Auburn automobiles but Evans soon returned as a salesman to the Arnold Auto Company. He also headed up the Arnold Auto Company’s new aerial photography business. In 1922, Evans became the automobile racing promoter at the short-lived Meridian Speedway in Wichita and he remained with the Arnold Auto Company until 1933 when he founded the Evans Motor Company in Wichita as a Dodge agency. He then added Plymouth automobiles to his agency. His daughter, Dorothy, became the office manager of the dealership and later became part owner of the company. In 1952, Carl sold the Evans Motor Company to Benjamin P. “Ben” Robinson of Sedalia, Missouri, although Evans remained a director in the new dealership. Carl E. Evans passed away on November 1, 1964 in Wichita, Kansas and his remains were cremated. Carl Evans was chosen to drive the Auburn 40 automobile that had been donated by the Arnold Automobile Company of Wichita, Kansas as the Pathfinder and press car for the Kansas Magazine Reliability Run that began on September 30. 1910. This four-day run covered 1,000 miles through Kansas and Oklahoma. The event was the first official reliability run to have its starting point in Wichita. 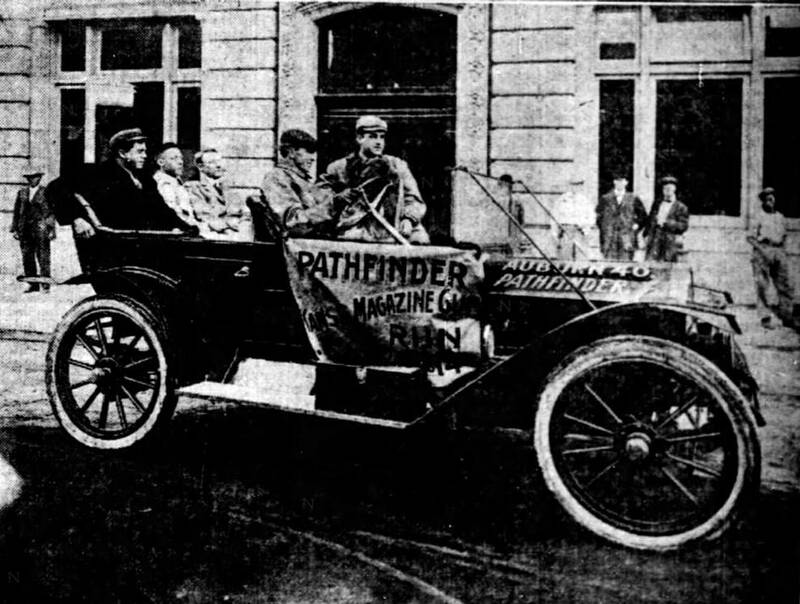 Left to right in the car are: George Cornell of the Cone-Cornell laundry, Edgar V. Moone of the Wichita Eagle newspaper, Roy Buckingham of the Wichita Beacon newspaper, driver Carl E. Evans at the steering wheel, Solomon “Sol” Arnold of the Arnold Auto Company (seated next to Carl Evans) and Sol’s dog, “Billy”. 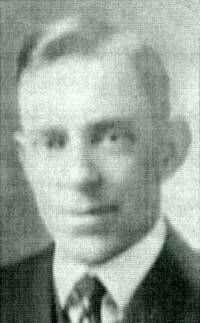 James A. Whitty of the Kansas Magazine is not shown in the photo as he joined the group when they reached Hutchinson, Kansas and accompanied them on the rest of the route. The photo was taken in front of the magazine’s new office in the Winne building in the 200 block of Douglas Avenue in Wichita.